I’ve tried a lot of red wine cakes over the years and this Red Wine Chocolate Bundt Cake from Food and Wine is my favorite. Not only is it delicious, but a great way to use up half a bottle of red wine. The recipe is especially handy when you buy a new wine that you like but don’t love, because even if the wine is not your favorite, it will still taste good when baked into the cake. This cake is rich enough that you can dust it with powdered sugar and serve with whipped cream and fruit. However, if you’d rather throw a chocolate ganache on top, that works too! Preheat oven to 325 degrees F. Spray a 10 inch (12 cup) Bundt pan with flour-added cooking spray or grease thoroughly and dust with flour. Stir together flour, cocoa powder, baking powder and salt. Beat butter and sugar together in a large mixing bowl, using high speed of electric mixer, until fluffy, then add eggs one at a time, beating well. Beat in vanilla. Add flour mixture to butter mixture gradually, alternating with wine. Pour into the pan and bake for 45 minutes. Note: I used a black Bundt pan. 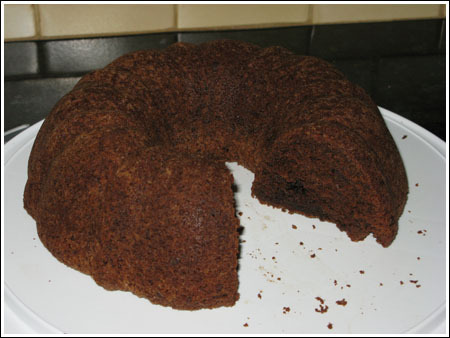 If you are using a heavy lighter colored Bundt pan, bake at 350. Cool on cooling rack for 10 minutes. Flip from pan and let cool completely before serving. This looks great! What’s better than combining two great ingredients like wine and chocolate?! hope you and the family had a lovely valentine’s day! they say you should never cook with a wine that isn’t worth drinking on it’s own – the “theys” i have heard/read this from are quite numbered and people whom i often look to for foodie advice/recipes/inspiration. as i don’t personally consume enough wine to consider myself an enthusiast i cannot say that i speak from experience(i am a champagne kind of girl). that being said – i know you can find some wonderful wines on the cheap – but i would never buy them without research – be it on line or with a wine specialist. glad you found a use for the wine. i will try to do a search for things to do with bad wine – other than making jelly, vinegar or dumping it on a compost heap. Yum! Sounds great, I’ll definetely have to make this. On another note, have you heard of the Vinturi? It is a wine aerator that is amazing! It can make bad wine taste decent and good wine great! You just hold it over your glass and pour your wine through it – very convenient, doesn’t require decanters, etc.. It runs around $35 online and it’s worth every penny, trust me! My husband & I do taste tests every time we open a bottle and we also always do it with company and all of us are amazed every time. I was going to ask if you liked it and saw the above comment. I love trying new recipes with wine in them. Todd actually liked it so I guess it was a good use of bad wine. That’s a great idea. Living alone I often have a cup or two leftover from bottles of wine so this is the perfect solution. Red wine, chocolate, and spices, yes please!! This cake sounds perfect. I’m sitting down to watch some television, and I would love a slice of this awesome-looking cake right now (I’d like this much more than any glass of wine)! Red wine and chocolate – like music to my ears! It’s always fun and rewarding to find a good, inexpensive wine – we love Old Moon Zinfandel from Trader Joes, only $4.99 a bottle – but you do end up with some clunkers in the hunt sometimes, don’t you? I’ve tasted wines that I could feel the headache in the first sip. Not a good sign.